Vines have been cultivated in Britain for centuries. In Greenhouses or sheltered gardens, grapes and some exotic newcomers are easy to grow and produce excellent crops of fruit. Growing a vine in a planter: Fill a large planter with a mixture of fifty per cent garden soil, twenty five per cent soil-based compost and twenty five per cent coarse sand. 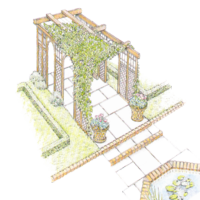 Plant a young vine that’s climbing stems can be trained up a pergola or trellis. 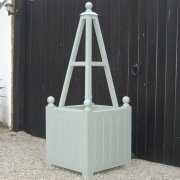 It will do well on your patio in a sunny position. At the end of the summer you will be able to pick a few bunches of delicious table grapes. Re-pot the vine every two years if possible or replace the first few centimetres of soil with fresh compost mixture. Do you live in a vine-growing region? : Like all cultivated plants, the vine has climatic requirements, especially when it comes to summer temperatures. While it can withstand extremely cold winters, it does not like late spring frosts, which destroy the buds, and it needs warmth and baking sun during the summer months to ripen the fruits. Vines planted in the south have a greater chance of success than those grown in the north. Plant them against a south-facing wall where they will have both shelter and full sun. Vines for wine: Grapes have been grown for hundreds and hundreds of years in Britain. They do need plenty of attention, so often become a specialist hobby for gardeners, especially those who fancy making their own Wine. A well-loved Vine will produce grapes for decades but can take up to four years to give you a substantial crop. 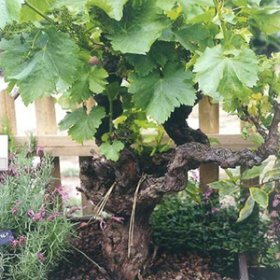 Many large estate gardens of the past had glasshouses dedicated to grape vines, and by paying great attention to the temperature requirements of each vine they would have been able to produce grapes nearly all year round. The best time to plant vines: Plant Vines in November and December. Whether the plant has a rootball or is bare�rooted, make sure the point where it has been grafted onto the rootstock is about 4cm above the level of the soil. If you experience very cold winters, or live in a frost pocket, protect the upper part of the plant by earthing up sand or light soil to cover the graft � or the lower buds where there is no graft. Remove in spring, after the risk of frost has passed. 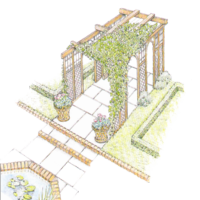 The best time to prune: Prune a trellised vine when it starts to produce leaves in March. In cooler northern regions this will prevent damage by late April frosts. It will also preserve the buds at the base, which will go on to develop later. Muscat Hamburgh : A classic Muscat variety which has large, dark red fruits. Muscat of Alexandria: Large fruits that are ready for picking late in the season..
Large fruits that are ready for picking late in the season..
Buckland Sweetwater: Round, pale green fruits which ripen to amber. They have a sweet flavour and grow in short, broad bunches. A heavy cropper. Brunt: Sold by many nurseries and garden centres. It’s aheavy crop of sweet fruit makes this dessert grape very popular. The vine will cover a wall but must get as much sun as possible. Cascade: A winner due to its resistance to mildew; a wine-making grape with small dark fruits. Sometimes listed as ’Seibel’.